It’s grape harvest at our family vineyard. The week started out slow and seemed to hit full tilt by Tuesday. For our family that means we go into harvest mode. Family roles change, new responsibilities get assigned and we run about as hard as we can for three weeks. In the category of bet you didn’t know, here are 5 weird things I do that are a bit odd if you haven’t been through a wine grape harvest. #5 Wear blue gloves to change the oil – When you change the oil on three tractors a forklift and a semi truck, you will get oil and grease head to toe. The gloves not only help keep you hands clean, they help you keep your grip on the oil pan nut. There is no keeping clean when you have to stick your arm into a 5-gallon bucket of used oil. Better to not drop it in the first place. 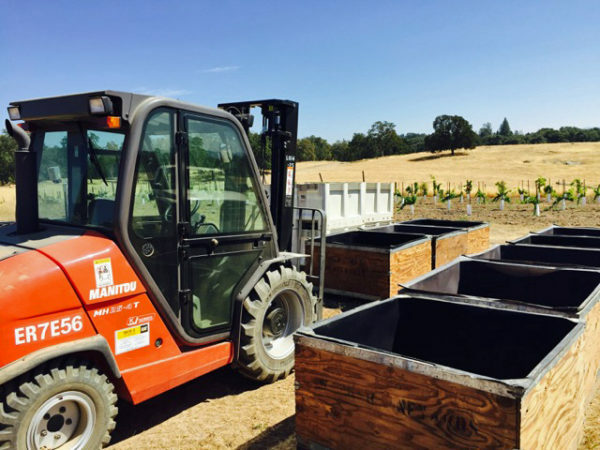 #4 Clean toilets – Ann is the vineyard manager so she plans and executes all the picking. 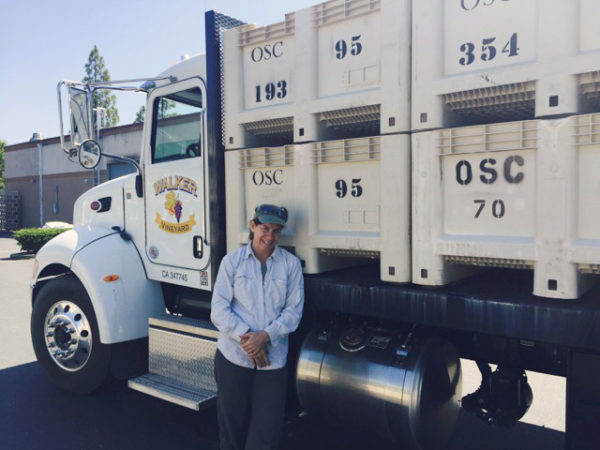 What’s more she does all of the deliveries, taking our wine grapes to the wineries from the Sierra Foothills to the Napa Valley. This doesn’t leave much time for domestic endeavors. As a result, I pick up all of the vacuuming, cooking and the favorite – cleaning the bathrooms! Sometimes I use the blue gloves here as well. #3 Take 20-minute naps – long workdays and longer weekends make for serious fatigue. Years ago in college I perfected the 20–minute nap. It is just enough to energize without the nap ‘hangover’ of a longer rest. I take a lot of 20–minute naps during harvest whether at the house or in the truck while the bins are being off loaded. #2 Leaf Picker – picking grapes is not unlike an assault on the vine. In a flurry of activity, grape clusters get pulled, grape knives cut and bunches drop in the picking bin. Often leaves go along for the ride. The winemakers however loathe the leaves since they clog up the de–stemmers. The best solution is to station a person at the bin and pick out the green leaves and the picking boxes are dumped. # 1 Lumper – the undignified name for the guy who weighs the bins and stacks them on the truck with the forklift. This is my number one weird job during harvest.